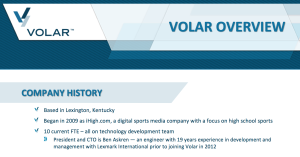 Lexington Kentucky based Volar Video is selling its streaming software and platform that handled over 13,000 live streams and over 2 million viewers over the past six months. The company has asked me to make it public that they are now considering all strategic alternatives, including an asset sale, acqui-hire, or selling a majority stake. You can download an overview of Volar’s platform and technology to get more details on what they have to offer. Volar has ten engineers that have worked together for two years building the software and platform. Anyone interested in talking to the company can email me and I’ll be happy to make an introduction.